The latest recovery.img is located inside the CWM/TWRP. Use Factory Reset/Wipe>Swipe to Factory Reset in CWM/TWRP for internal boot. 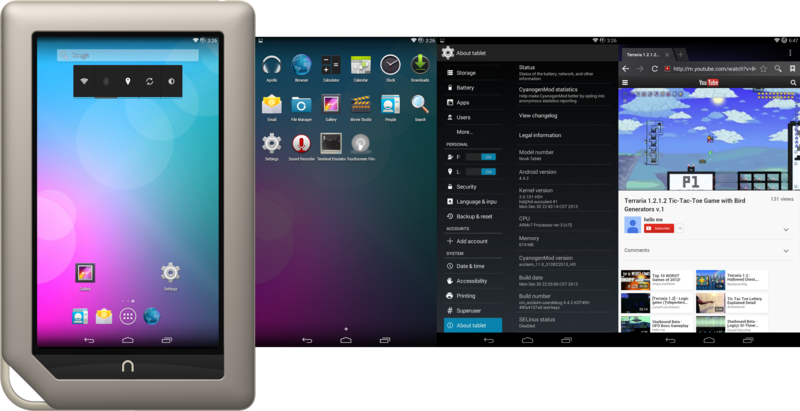 Use TWRP Wipe>Advance Wipe, select SDCard Data>Swipe to Wipe for SDCard boot. Else, you can flash flash_format_data1_sdcard_acclaim.zip for SDCard boot. This is a 2GB IMG clone of bootable cm-11.0 SDCard for Nook Tablet. • Boot your device from SDCard into “SDC Recovery” via the Cyanoboot menu. • Reboot into “SDC Recovery“ and install the SDC micro GAPP. • Reboot your device into “SDC Recovery”. The instructions state “You need to have the latest CWM/TWRP installed” and while I see a link to TWRP I cannot find a link to the latest CWM which I’d prefer to use. So can someone please point me in the right direction? Thanks. is this for nook tablet or nook HD sd images all have hd? Hi, first of all. Nice job. I have been using 4.2 and now ready to upgrade to 4.4.2. I am using a 16GB microsd and all went well. Now, the ext3 is 3gb while my sdcard is now 11GB. How can I extend my ext3 to be up to 7GB? I can’t seem to find any guide and I have been trying to use MiniTool Partition to merge, extend etc without successu. Hope you can help. Thanks. Previously I had 4.2 version of Android and everything worked well until I accidentely left the tablet discharge, forcing it to shutdown suddenly while I was playing. Since that day, it is impossible to boot so I would like to make a new bootable 64Go microSD card (the same as before). Your steps leave me with a black screen after the first boot… Everything has been done several times, and I have an infinite loop after the second boot (shutdown forced). I’ve seen an message telling me “Upgrading apps”, “Flashing boot” or something like that, but then it stayed stucked on cyanogenmod animated boot logo.